Rio de Janeiro is the second largest city in Brazil and is partly a UNESCO World Heritage Site. The city is famous for its carnival and music as well as its beaches but it also boasts a current modern world wonder in the statue of Christ the Redeemer high above the city on the Corcovado Mountain. Other sites to visit in Rio include Sugarloaf Mountain, Sambodromo, Botafogo Cave, Maracana Stadium, Paco Imperial, Municipal Theatre, Museu Nacional de Belas Artes, Barra da Tijuca, and the Museum of Natural History. There are many historic churches all over the city including the Candeleria Church and Rio de Janeiro Cathedral. 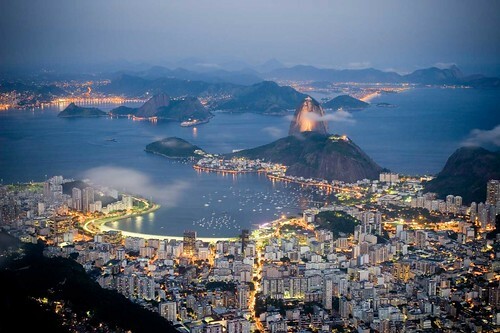 Rio is known for the samba and bossa nova music traditions. Famous beaches worth visiting in the city include Ipanema and Copacabana. Typical food of Rio include feijoada which a black bean stew with pork and pepper and orange peel, chirrasco which is meat roasted over an open ground pit, leao veloso or shrimp head soup. Some places to try Brazilian cuisine in the city include Cachambeer, Rio Scenarium, and Olympe.